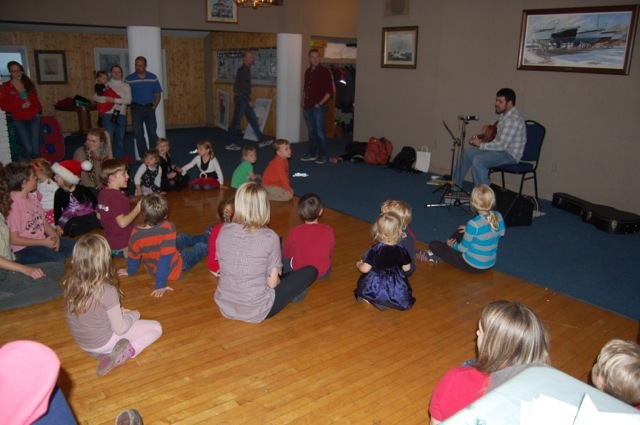 Caroling starts at 1730hrs with Tim Hallman on the ivories! Carol for about an hour then at 1900hrs…Roast Beef Feast! 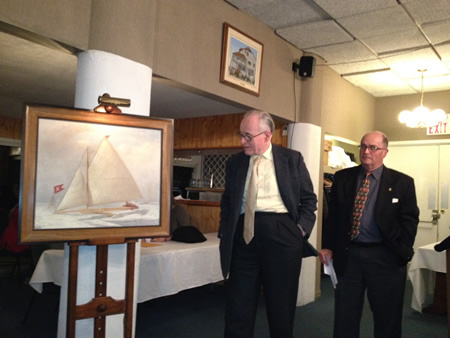 The 2012 AGM November 29 was the time and venue for the unveiling of the beautiful painting of the Kingston Ice Yacht Club iceboat "Snow Cloud". The existance of this painting only came to light this past summer when the original donor, long-time Club member Mr John Weatherall, asked about its whereabouts. Rescued from storage and properly framed, it now hangs above the fireplace in the Partridge Room at the Club. The photo shows Mr. Weatherall and Club Archivist David Page doing the honours. Family Christmas Party a huge success! 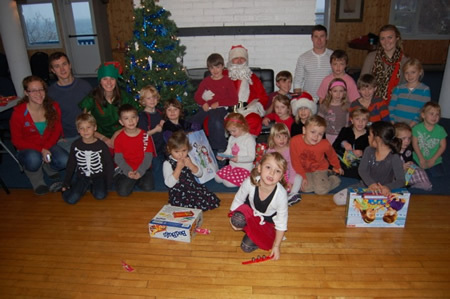 Special thanks to the Queen's Sailing Team, and the many volunteers that made the 2012 KYC Family Christmas Party a huge success! 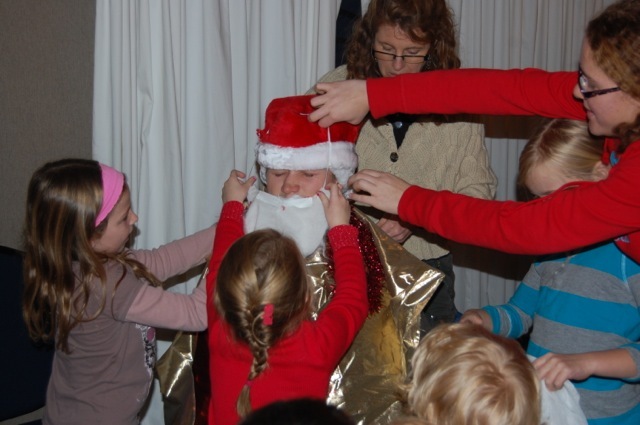 Over 25 kids joined in the fun of making puppets, doing crafts, playing games, singing with Jeff Lamothe, opening a piñata, and welcoming Santa Claus to KYC's second floor! Cheers to a fun event to start off the holiday season:). Welcome members and guests for our Annual Christmas Get Together. Cash bar with finger foods. Special feature will be the screening of 'LAKE EFFECT', the first of a planned series of films on artists connected with Kingston. Lake Effect is 20-minutes in length and features Shane Dark, Lisa Figge, Maureen Sheridan, Don Maynard and the music of The Gertrudes. As another testament to KYC's very successful season on the water, KYC is well represented in the nominations for the 2012 Sail Canada Awards. Congratulations to Paul Davis, Robert Davis, Rob Frost, Hugh McRae, Violet Stafford, Ali Tenhove, and the 2012 Shark Worlds Organizing Committee - who are all representing KYC as nominees for awards at the 2012 Sail Canada Awards held on Saturday, January 19, 2013 in Toronto. Environment Canada (EC) is responsible for providing marine weather and ice information, and issuing all marine weather alerts for Canadian waters. Environment Canada is committed to understanding the needs of mariners. We are conducting a survey to better understand those needs and the use of our services. We would like as many mariners as possible to complete the survey. If you are a mariner please take a few minutes to complete the survey. If you know other mariners who may be interested in participating, please share this invitation with them. Your participation will remain completely confidential and anonymous. Results will be used to shape the weather information that EC provides to mariners. If you have any questions regarding this survey, please contact Daniel Huang at 709-256-6608 or daniel.huang@ec.gc.ca.